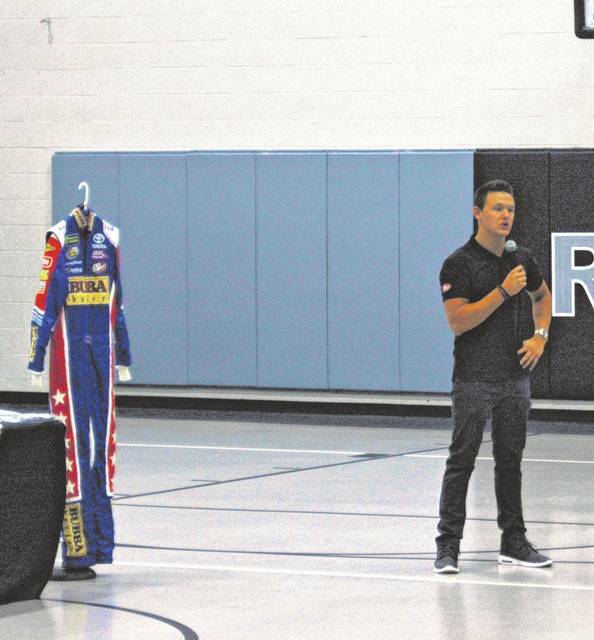 BIDWELL — River Valley Middle School celebrated Right to Read Week with a special guest speaker, current NASCAR Cup driver Gray Gaulding. Gaulding is currently the youngest driver in NASCAR’s highest level on competition at 20 years old. Gaulding grew up in a family of racers, being a third generation driver. In talking with students Gaulding told them how reading and education has played an important role in his success as a race car driver. “You need to work hard, I tell a lot of people I talk to, don’t be afraid to follow your dreams and do what you love. I’m very fortunate to say that I do that every week, I’m 20 years old racing at the highest level in NASCAR and that was always my dream as a kid,” said Gaulding. Despite growing up racing everything from dirt bikes to bandolero cars as young as three years old, his parents impressed upon him the importance of reading and education. In his NASCAR career Gaulding uses reading skills each week in preparation at each track. He explained to the students how his education helps him better prepare for each race in knowing how the equipment will react in certain conditions and how it has reacted in the past at that given track. “Reading is very important, it’s not my favorite thing to do but I try to read a lot of each race track I go to, going to the next race and reading articles about what the tires did last time I was at the race track and little things like that,” said Gaulding. Gaulding left the students with an encouragement for the students, to stick together and work hard despite differences. Gaulding spent time answering questions from students and signed several items for students.